Blocked drains can be a nuisance, but if caught and dealt with early on they are relatively easy to fix and you might be able to avoid more serious leaks, overflows or electrical damage which can sometimes occur. 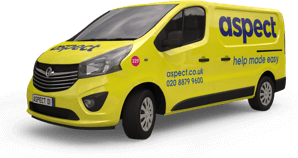 If you’d prefer to call the experts in, our specialist drainage engineers are on call 24 hours a day. Is your drain indoors or outside? If your drain is outside it will most likely have been caused by a build-up of dead leaves, or even tree roots which can find their way into pipes and cause a barrier to the flow of water. If it’s an indoor blockage, it could have occurred because of heavy materials or objects being flushed down the drain. Blocked drains are often caused by sanitary products, paper towels or other hard to flush materials which can clog pipes and obstruct drains. Wipes, tissues, and even hair can also be the culprits. Is it a kitchen, bathroom or toilet drain? As above, if blocked drains in the toilet or bathroom are a problem, it’s usually due to the items you flush down your toilet. If on the other hand, if it’s a kitchen drain that is blocked, it could be because of food particles, grease and other debris which is washed into the pipes from your kitchen sink or washer. These can cause significant blockages which may require a professional drainage engineer. If you think you may have one of these problems then give our contact centre a call on 020 8879 9600. The most important thing you can do to prevent drains from becoming blocked in the first place is to monitor the waste that goes down your drain pipes on a regular basis. For kitchens, this means scraping plates thoroughly to ensure food does not go down drains, and using adequate soaps and detergents to break down the grease and oil used in cooking. Don’t pour grease directly down the drain; if possible pour it into a container, wait for it to cool and throw it in the bin. If you must pour it into the drain, always follow with a blast of cold water as this solidifies the grease and stops it from clinging to pipes, thus preventing blocked drains. In the bathroom, avoid dropping any foreign objects such as hair grips down drains as these will quickly collect other debris such as hair and cause a block. Nappies, tampons, face wipes, and cotton wool should be placed in the bin and not flushed down toilets where they may get jammed in narrow pipes and cause an overflow of water. Using excessive amounts of toilet paper can also be a common factor in drains becoming blocked, so ensure you are using just enough each time. It goes without saying that you should always try to keep the drains in your yard free from leaves, foliage or any other garden waste which could be washed into the drain and cause an obstruction. Sweeping your garden regularly and using a compost heap for leaves is one way of preventing these drains from becoming blocked. If blocked drains become a problem, you may need to get a professional drainage engineer out to pinpoint the cause and alleviate the blockage. There are certain techniques a drainage expert will use, including using CCTV to look at awkward and hard to reach drains to see what has blocked the flow of water. Professional plumbers can also advise you of what to do in future to prevent this from happening again. 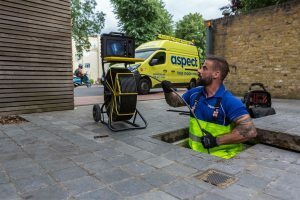 Aspect have a specialised workforce who can handle all issues with blocked drains, and offer a range of services related to drainage in your home. If you are suffering with any of the signs above, give us a call and we will send out one of our fully trained engineers to resolve the problem.